Few activities bring up strong feelings of nostalgia like mini golf. Whether it’s a simple course or a miniature mountain, it’s pure and simple fun. 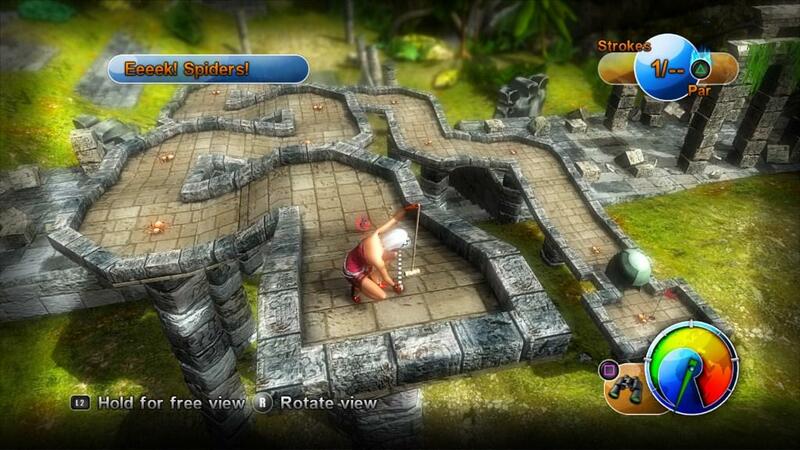 Zen Studios has brought the light-hearted sport to the PS3 in budget-priced PSN title, Planet Minigolf. Has their endeavor resulted in a final product worth your time and money? 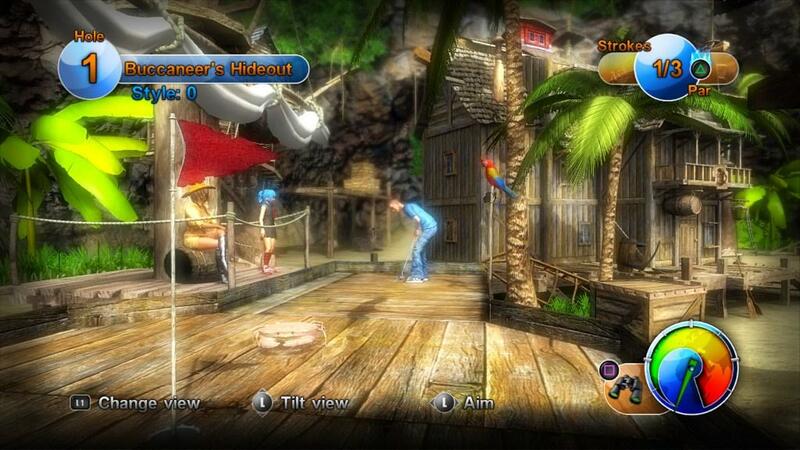 Planet Minigolf’s main menu loads players into an animated Caribbean shack. 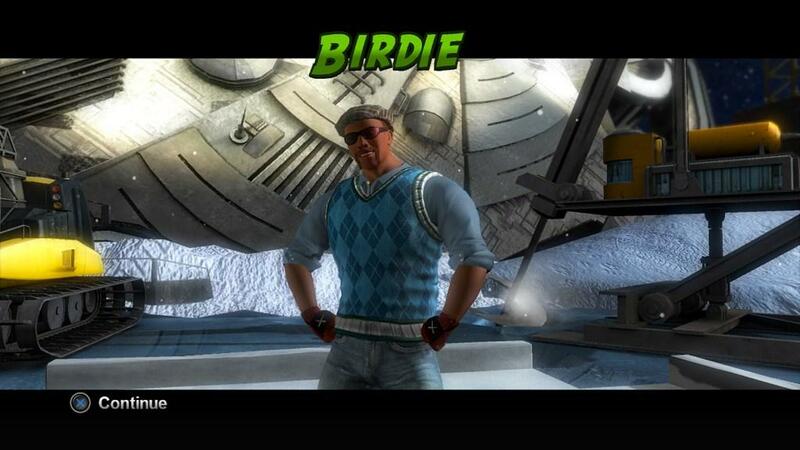 Your chosen character is sitting in a wicker chair, patiently waiting to hit the course. A total of five playable characters are available but represent stereotypical architypes: the curvaceous cowgirl, a massive bodybuilder, a blue-haired schoolgirl, a skater punk and the mall-rat blonde. 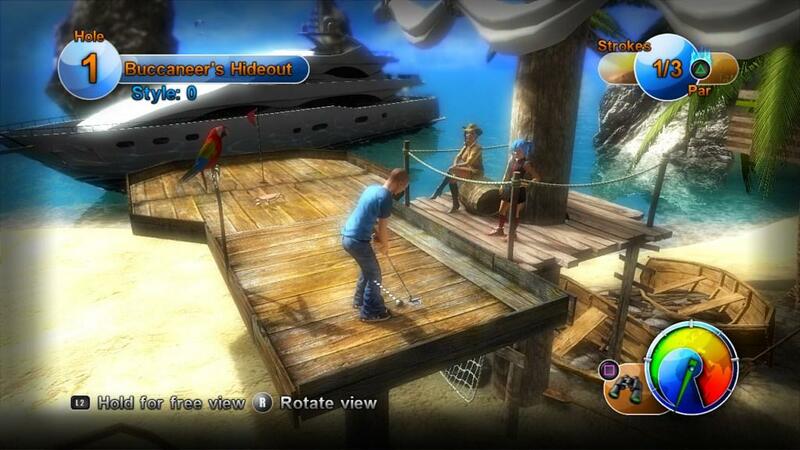 It’s possible to customize your character with a minimal selection of clothing, putters and balls, but most items are locked until you play through much of the game. Getting started is quick and easy because the load times are barely noticeable. It only takes 10-15 seconds to load a set of three hole, which keeps the action moving. Even the load screens provide interaction in the form of floating Plaroid pictures of the course that are moved about by slick six-axis control. Pausing in-game will allow you to reset the ball (at the cost of a stroke), restart the entire round, give up (finishes the hole with a score of 15) or learn how to play. Granted, helpful hints will pop-up when you first play or select a game mode. The problem is that much more direction is needed than what is initially provided, especially when it comes to the camera. One of the biggest issues I have with Planet Minigolf is the camera control. Maybe I am accustomed to having a “fly over” or “preview” option while playing other golf titles or maybe I want to see the entire hole to plan my attack. Unfortunately, even the “binocular view” turns out to be unwieldy and downright useless in some cases. What’s sad is that the camera controls (or lack thereof) prevent you from being able to inspect the detail on each course. Planet Minigolf contains 144 pre-made courses set in four different environments. Buccaneer’s Hideout is the pirate bay complete with sunken ships, treasure, and crabs. Soho is set in the heart of England with neon lights and helicopters flying overhead. The Polar Station adds slippery surfaces in front of a crashed UFO backdrop. Finally, the Ancient Valley puts players in a jungle as they hit through ancient Mayan ruins. Zen Studios completely trusted their level designers and the end product shows it. Each locale is fully realized with wildlife and ambient sounds. Little things like the rails that keep you on the course vary by location from straight to curved to make you change your strategy. I was anxious to finish a hole to see what I would be challenged with next. Even mundane levels are spiced up with animals (ants, crabs, snakes, and more) that will interfere with your perfect shot. The characters that you aren’t currently playing as will sometimes be sitting on the sidelines watching you play.Courses will be sprinkled with some of the nine power-ups available in-game. 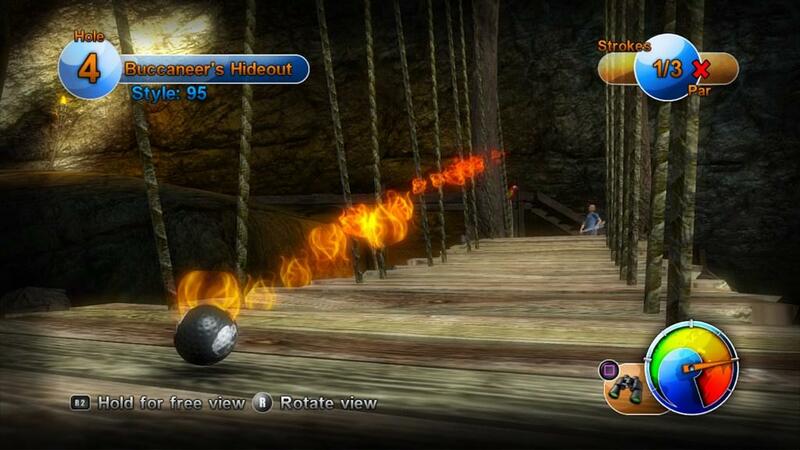 These range from the obvious, such as a speed boost or hole magnet to the outlandish super-sized ball. Sometimes they help to guide you in the proper way to complete a hole. At other times they will only serve to distract. However, they disappear when going to the next hole so use them before they’re gone. Perfectionists will find Planet Minigolf a tough beast to master. Why? There is no practice mode. In a game that delights in providing challenge and throwing unexpected barriers your way, this is a shame. I would love to be able to play a perfect round, but when I constantly falter on the same hole I get frustrated. Well, I guess I could do their job for them, take the time to recreate the course using the course editor, and then play it at will. The in-game course editor is robust but user friendly. With a course layout in mind, it took a few minutes to translate it to the game world. Selecting a good variety of props and power-ups added another few minutes before I was able to take it on a test run. As long as your hole is playable, you can publish it to make it instantly available locally or online. There is even an option to string together custom holes for entire player created courses. Publishing them for use by the world is simple, but the online sorting methodology is semi-broken. It’s more difficult than necessary to find the highest rated hole or the one that’s been download the most. This sorting issue stands out because finding a certain player or theme is easy. While you’re online, why not give multiplayer a shot? You can play singles, one-on-one, team play and more. All options are straightforward and self-explanatory. Thus, it takes no time to get into a match against a random opponent. Even during the evening, it would take some time to find someone to play against but that surely will fluctuate for everyone. One item I really missed was the ability to challenge someone to a rematch. Finally, Zen Studios added a wonderful way to manage replays. As mentioned previously, some of the holes are insane on the creative and difficulty level. What’s a hole-in-one worth if you can’t share it? The replays can easily be saved to the PS3 hard drive or automatically uploaded to Youtube. That’s right; it’s integrated into the game. Just select the replay of your awesome shot, provide your username and password for Youtube, and within a few minutes (depending on your internet connection) it’s live under your account. It works well and fits perfectly with this type of game. Can you tell the strongly mixed feelings that I have for Planet Minigolf? The courses, power-ups, and in-game editor are fantastic. There’s enough fun provided in the game and available from user-generated content to scratch your mini golf itch for the weeks and months to come. However, the glaring lack of a practice mode, awful camera control and lackluster instructions really impact the experience. If you can look past these slip-ups then get ready for a lot of mini golf fun! It's a fun mini golf game with potential for great user-created content. However, rough camera controls and no practice mode for specific holes work against it. Planet Minigolf is worth your attention if you can overlook some shortcomings. My real gaming roots started with the NES at a young age. This meant little money and a lot of time, which resulted in making the most of a few classic titles like Super Mario Bros. 3 and Zelda 1 & 2. I've always played PC games from Wolfenstein 3D and StarCraft to EverQuest and Monkey Island. Flash forward 20 years and you'll find my entertainment center home to a PS3 and Wii, but my PC will always have a special place in my heart. When it comes to genres, I play anything that I can get my hands on but prefer games with good story and healthy adventure. Uncharted 2: Among Thieves, Spider-man: Shattered Dimensions, and The Ball are my favorite games of the recent past. There are only a handful of games that I actually go back and revisit multiple times as my "gaming mood" constantly changes. As such, I'm willing to play anything with an open mind to see what it has to offer. I've been contributing to GamingNexus since Fall 2009. I thoroughly enjoy having an outlet for my opinions and hope you enjoy reading them. Drop me a line if you are in the mood; I love feedback!